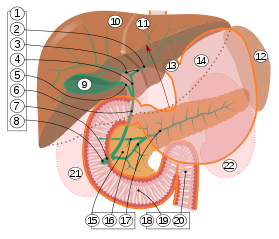 Several problems can arise within the common bile duct. A diameter of more than 8 mm is regarded as abnormal dilatation and is a sign of cholestasis. It normally gets slightly dilated after cholecystectomy, with upper limit (95% prediction interval) being about 10 mm after a few months. On abdominal ultrasonography, the common bile duct is generally seen most readily in the perihilar area (the border area between the common hepatic duct and the CBD, by the hilum of the liver). The absence of Doppler signal distinguishes it from the portal vein and hepatic artery. Borderline of a dilated perihilar bile duct, measuring 8 mm. Dilatation of CBD due to Ampullary tumor. If clogged by a gallstone, a condition called choledocholithiasis can result. In this clogged state, the duct is especially vulnerable to an infection called ascending cholangitis. 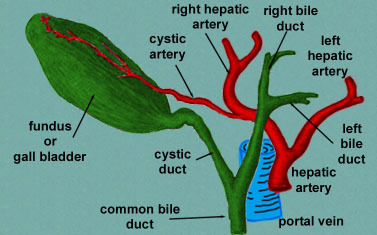 Very rare deformities of the common bile duct are cystic dilations (4 cm), choledochoceles (cystic dilation of the ampula of Vater (3–8 cm)), and biliary atresia. Blockage of the common bile duct and related jaundice has been documented since at least since the time of Erasistratus. ^ Agabegi, Steven S.; Agabegi, Elizabeth D. (23 August 2012). Step-Up to Medicine. Lippincott Williams & Wilkins. p. 136. ISBN 9781609133603. ^ Feng, B; Song, Q (1995). "Does the common bile duct dilate after cholecystectomy? Sonographic evaluation in 234 patients". American Journal of Roentgenology. 165 (4): 859–861. doi:10.2214/ajr.165.4.7676981. ISSN 0361-803X. ^ Humes, H. David (2001). Kelley's Essentials of Internal Medicine. Lippincott Williams & Wilkins. p. 229. ISBN 978-0781719377. Anatomy figure: 38:06-08 at Human Anatomy Online, SUNY Downstate Medical Center - "The gallbladder and extrahepatic bile ducts."